Even if you’re able to battle through the server problems plaguing Pokémon Go, you might be struck with another: the game doesn’t explain how anything works! 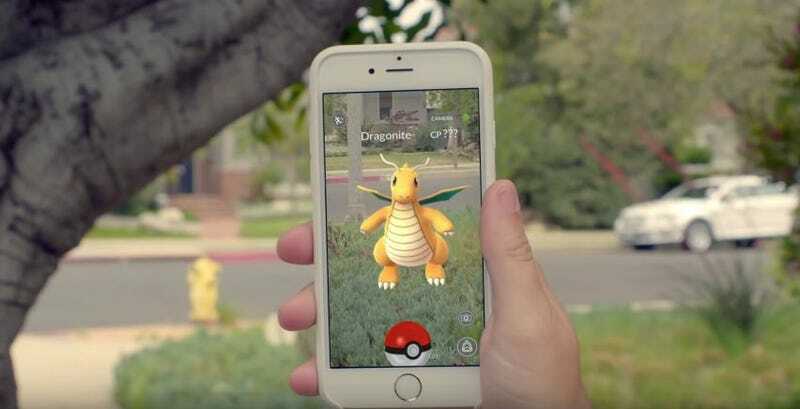 There’s not a single tutorial sequence in Pokémon Go outside of a short series of tips, with players expected to pick up everything on the fly. It’s an odd choice. If you’re struggling to figure out how it all works, I’ve got you covered. This isn’t quite a tips post—we’re still working our way through the game—but if anything isn’t covered, make sure to drop a line in the comments. You’re quickly greeted by a bunch of icons, three of which are important. The first arrow is pointing to a patch of grass, which indicates a pokémon may be nearby. If you walk over to that area—literally walk over there!—it’s possible that a pokémon may show its face. The second arrow points to a pokestop, places where you can grab more pokeballs and, often, eggs. You don’t need to be right on top of it to activate any icon. See that pulsing circle around your character? So long as the icon falls within that circle, you can tap the screen and it’ll kick things off. When you walk through an area, usually near a pile of grass, pokémon will jump out and appear on the screen. If they’re in your circle, tapping the creature will take you to the “capture” phase of Pokémon Go. In this case, I have augmented reality turned on, which means the screen is filled with whatever my camera is looking at. This tends to chew up the battery and isn’t a requirement, so feel free to turn augmented reality off. When capturing begins, the creature doesn’t do much but kinda dance around the screen, waiting for you to flick a pokeball at it. The most important factor in whether you’ll be able to nab a pokémon is waiting for the green circle to become small and flicking the ball at or nearby them. As you find more powerful pokémon, it’s possible for them to run away or escape from the pokeball that you’ve thrown, just like the real games. Both the player and individual pokémon can be upgraded in the game. In fact, in order to participate in gym battles, you need to reach level five. Leveling up for pokémon happens by increasing their power, which requires various items that you gain by capturing pokémon, or evolution. You’ll find gyms all over the map, but chances are, you won’t be able to wander into your backyard. They tend to be located in places where other people might congregate, forcing players to defend their turf from rivals. There will already be a color associated with it—yellow, blue, or red. When you claim a gym, a pokémon has to be assigned to defend it. That pokémon is then removed from your current collection, until it’s defeated. Simply beating one battle in a gym won’t be enough; each one has “prestige” that must be whittled down in order to ultimately overtake it. Unsurprisingly, combat’s a lot simpler in Pokémon Go than the mainline games. It’s not turn-based, largely automatic, and has more to do with taking advantage of the game’s elemental advantages and ensuring you’re throwing the most powerful pokémon (read: combat points) into the fight. You tap the screen, bring in new pokémon , and rinse ‘n repeat. If they faint, use a revive. If they’re merely hurt, use a potion. Though many items can be naturally found at pokestops, if you’re desperate for one, it’s possible to purchase them using currency earned by leveling up and fighting (specifically occupying gyms) or spending real money to expedite the process. You start the game with a single egg incubator, though you can purchase another one through the store. Eggs are hatched by going outside and walking around a certain distance. In addition to new pokémon, eggs grant you a bunch of experience points and candies needed to power up pokémon.